I saw everyday pottery from before the modern era in various parts of Spain. 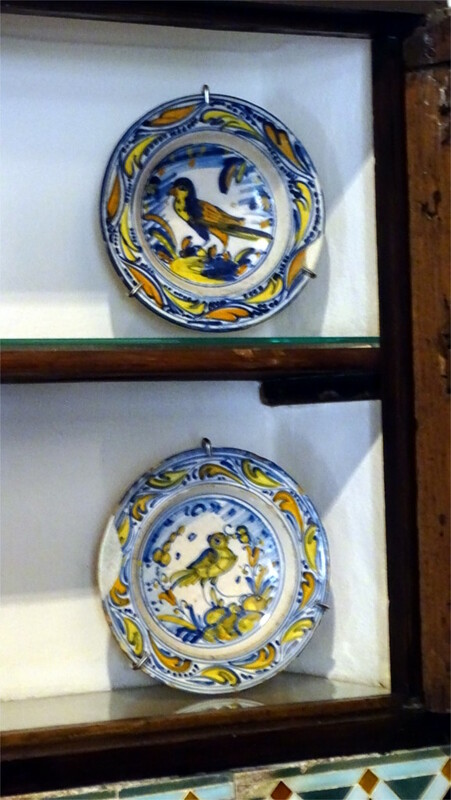 In a village museum in Andalucia I saw the plate shown in the featured photo. The decoration looked very modern. When I looked at the date, it turned out to be from the early 20th century. I liked the red colour of the fired clay, which you see in the rim. The thin white glaze and the faded green decoration looked very nice too. In the same place, I saw the pieces which you see above in the photo on the left. These pieces are also Andalucian and come from the early 20th century. 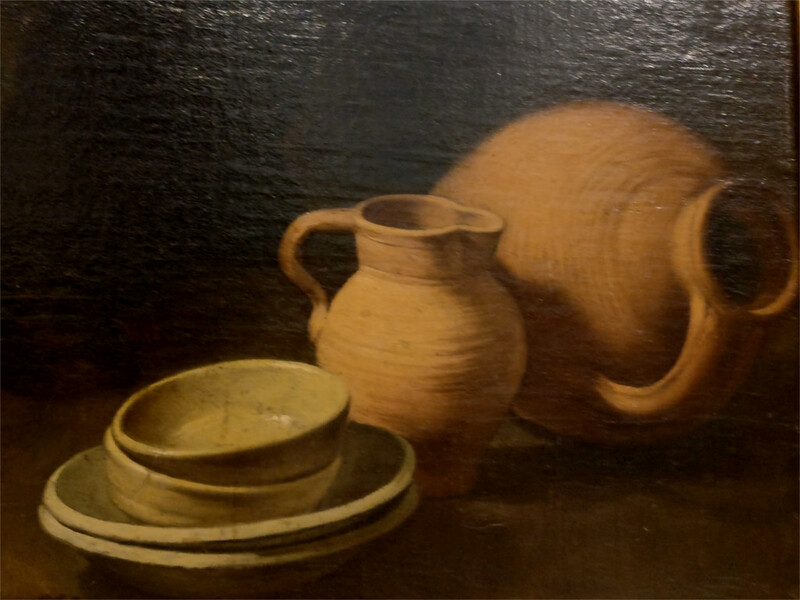 On the right, above, is a detail from a painting by Murillo. 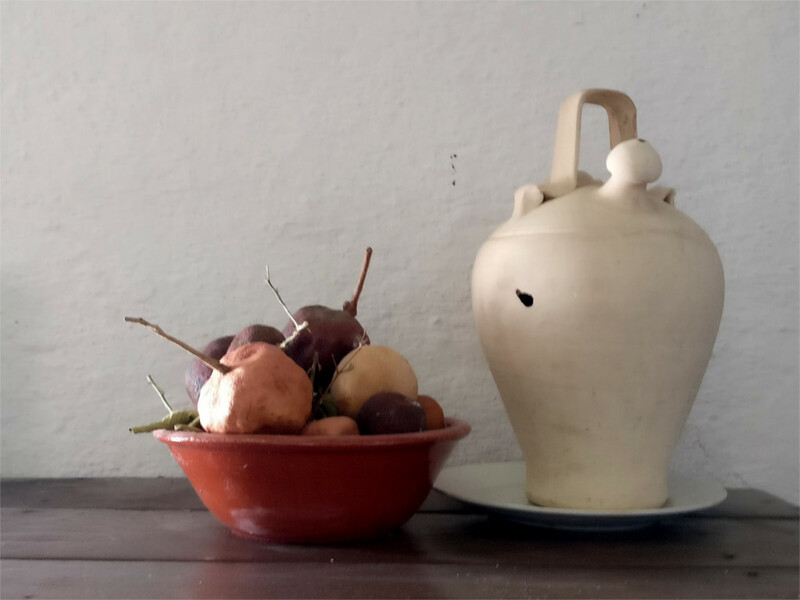 If it shows contemporary pottery, then it is Andalucian, and from the early 17th century. Three hundred years has changed this pottery a little. The shapes are very similar. The newer pottery has somewhat of a brighter glaze. This could be because the firing kilns are hotter, and therefore allow different glazing. Finally, I leave you with photos of pottery I saw in Toledo, said to be from El Greco’s time. If this is an example of mid-16th century Castillian pottery, then it is remarkably similar in colour and design to tiles from other parts of Spain and Portugal of that time. Interestingly, even now one finds in southern France, pottery with similar decoration. Although every Indian now seems to know about the bull run of Pamplona, the football clubs of Madrid and Barcelona, and Bunyol’s festival of La Tomatina, until a few years ago a random person in a Mumbai train would not be able to say anything definite about Spain. The historical connection between India and Spain being so meagre, it is odd to come across a beautiful Renaissance building in Seville called the General Archives of the Indies. It took me a moment to realize that the Indies in question lie across the Atlantic. We never entered to gawp at the eight kilometers of shelves which hold 80 million pages dating from the 16th century CE to the end of the Spanish empire in the 19th century CE. I doubt that access is permitted to this treasure trove of recent history. However, some of the documents of general interest are on display. The Family drew my attention away from the cathedral to this building right outside. Apparently it was first built as a market hall for Seville, to draw merchants out from the cathedral, where they had conducted their business till then. 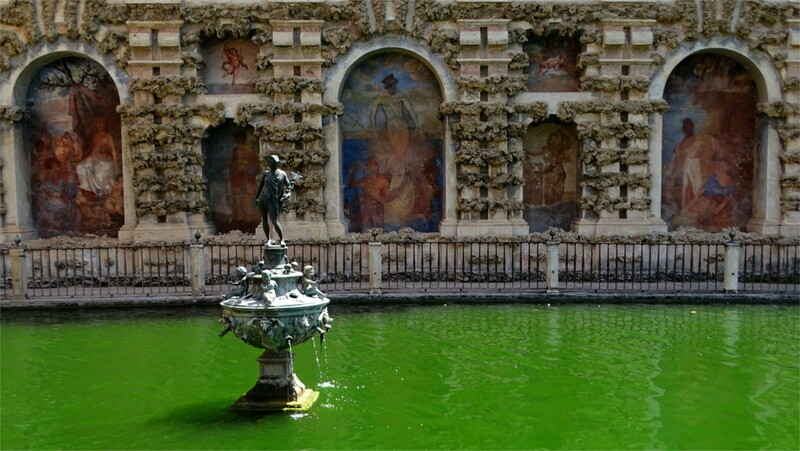 King Philip II of Spain got his favourite architect, Juan de Herreira, to design this building. The clean uncluttered lines look beautifully modern. The horse carriage that you see in this photo will be visible on any day I guess, standing in that particular patch of shadow. This spot is one of the "stations" where tourists can hire a carriage. Why is Seville full of these antiquated and expensive things? They seem to have something to do with the April Fair in this region. My first exposure to the most famous dance form of Spain must have been through Carlos Saura’s film trilogy on Flamenco. Of the three, I may have seen Carmen first, because I spent a while immersed in Paco de Lucia’s music, and he acted in the movie. Soon after that I encountered the dance in a live street performance in Tokyo around the "Eiffel Tower". It took me a lifetime to get to the world’s capital of the dance and music known as Flamenco. Before starting our trip I asked The Family about the three must-dos of Spain: Flamenco, bullfights and soccer. She agreed to Flamenco. Then there was the difficult choice of whether to watch a performance in Madrid or Andalucia. 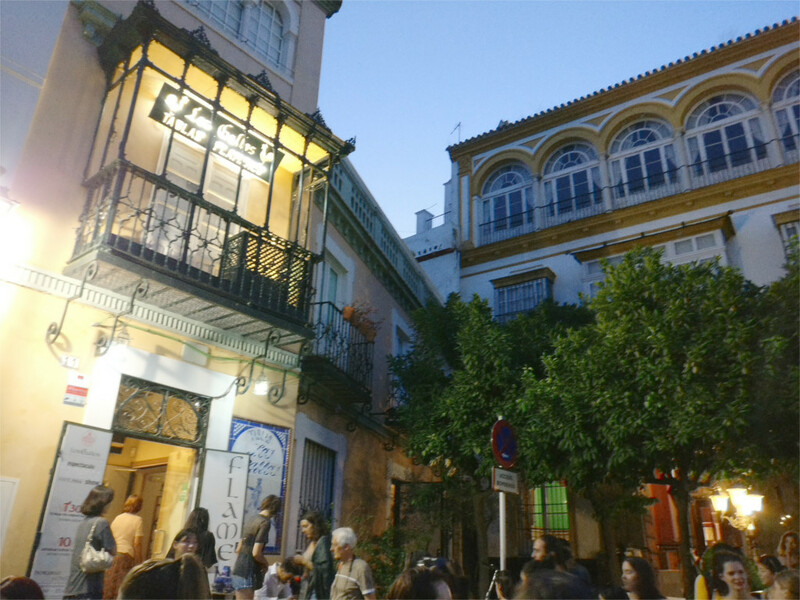 We decided that the birthplace of Flamenco should be good enough for us, so Seville was what we settled on. 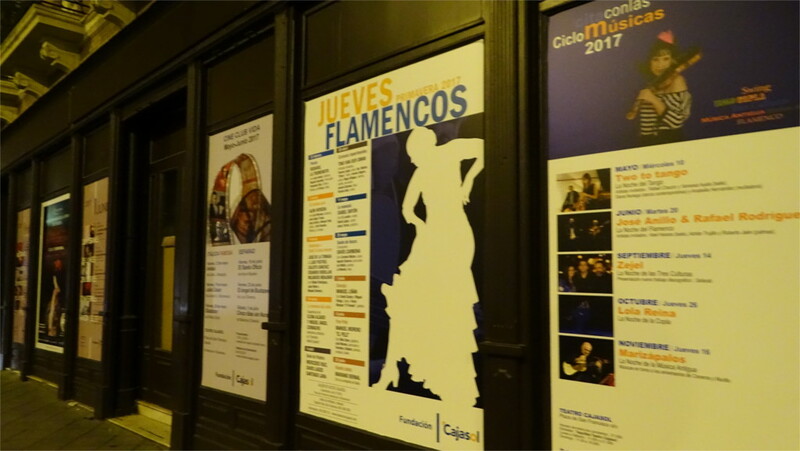 It is clear that Seville takes its Flamenco seriously. The city hall was plastered with posters of performances and competitions. We had come to the right place. Flamenco developed as a popular entertainment about a century ago in music bars called cafes cantantes. It has become very professional now, and shows are held today in tablaos. The Spanish word means stage, but it seems to imply something like the gharana of Indian music, with each tablao playing a larger role as a training ground and keeper of a style. The Tablao Los Gallos was highly recommended, and we found tickets for a show which lasted a little longer than an hour. The music which accompanies the dance is clearly descended from the middle eastern tradition, with large borrowings from other sources. Apart from the dance, there were interludes of flamenco guitar. The guitar tradition is about sixty years old, and, taken out of the context of the dance, sounds quite different. Later I encountered Flamenco again in Granada. In southern Spain, this music and dance is never too far away. The Merriam-Webster dictionary defines Mudejar as a Muslim living under Christian kings especially during the 8th to 11th centuries. It also says that the first known use of the word is from 1829. Soon afterwards it was applied to a style of Spanish architecture in the sense that it still carries. The style is seen in all the photos here. The main characteristics of the style are brickwork, decoration with tiles, intricate carpentry, and the use of geometrical motifs in decoration. The featured photo is of the grand mosque in Granada, and shows all these features. The mosque was closed because I went there in the afternoon of the last day of Ramzan, so I did not manage to see the interior. Still, the exterior gave a good indication of what the interior would have been like. 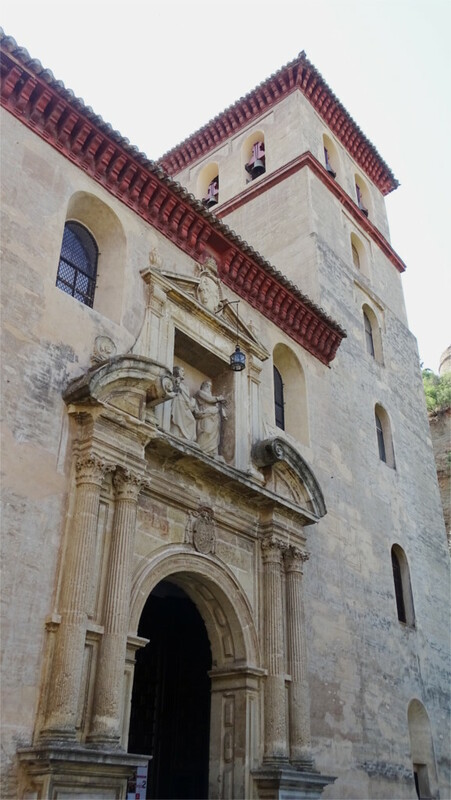 In Granada, near one end of Plaza Nueva is the church of San Gil and Santa Ana (photo above), an exemplary piece of Mudejar architecture. Look at the beautiful azulejos (tiles) at the top, above the bells, the woodwork just below it, the beautiful tiles above each of the romanesque arches, and the ornate pillar just below the bells. Again, because I was always there at the wrong time, I could not see the interior. Notice the beautiful woodwork in these three photos. The one on the left is the exterior of the church of San Nicholas. I climbed up to it on a really hot day, and was too dehydrated to walk in. I sat in the shade outside and drank a lot of water. 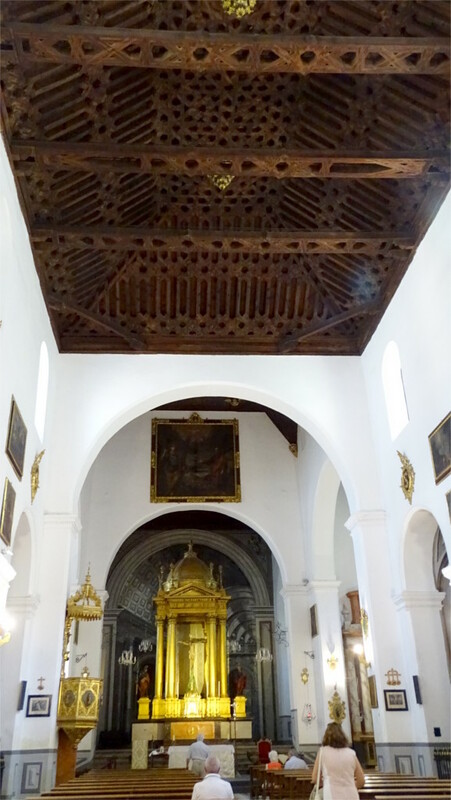 The other two photos above show the church of San Pedro and San Pablo. Typical Mudejar elements are visible outside. Inside, the ceiling is covered in incredibly beautiful woodwork. A friend told me about his perception of the difference between Islamic and Christian architecture in the Alhambra: that they embody different philosophies of what make something grand. These churches combine these two world views: the high interiors are grand in the manner of churches you see all over Europe, and the beautiful intricate workmanship brings to it the Asian love of detail. One wonders about the missed paths of history; if only the Jews had not been expelled in 1492, and the Muslims had been allowed to stay on after the 25 more years that they did, what kind of new architectural styles would have evolved as engineering improved. 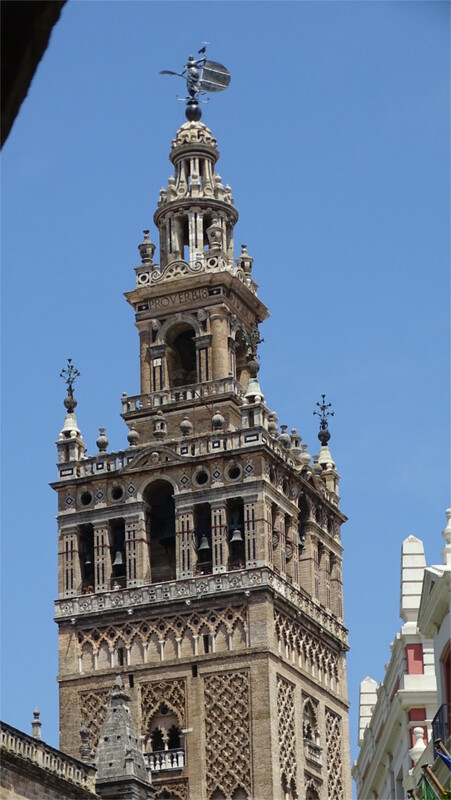 In my mind the Giralda of Seville (photo above) is the grandest of these towers. 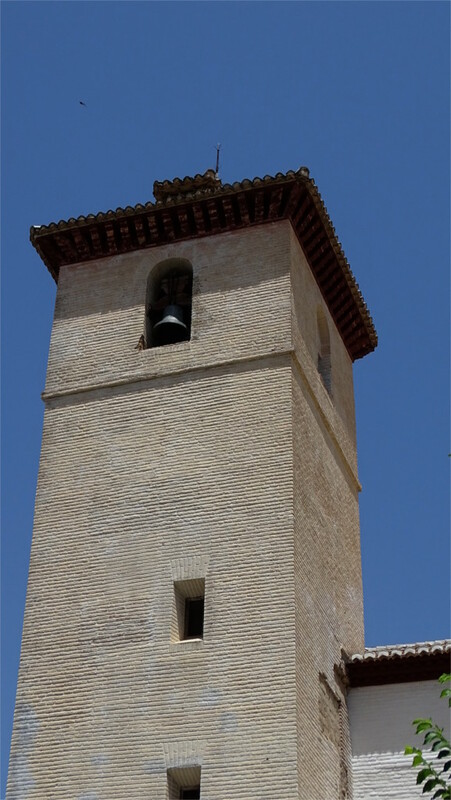 Technically it does not belong to the Mudejar style, because it was built before the Christian reconquest, and was only converted from a minaret to a bell tower afterwards. However, it has all the elements of this style: brickwork to build up a really high tower and incredibly detailed external ornamentation. Finally, a moment of duh-ness or serendipity, whatever you may call it. I looked back at the photos I took a year ago inside the Royal Palace of Sintra and realized that I had seen the Mudejar style before. 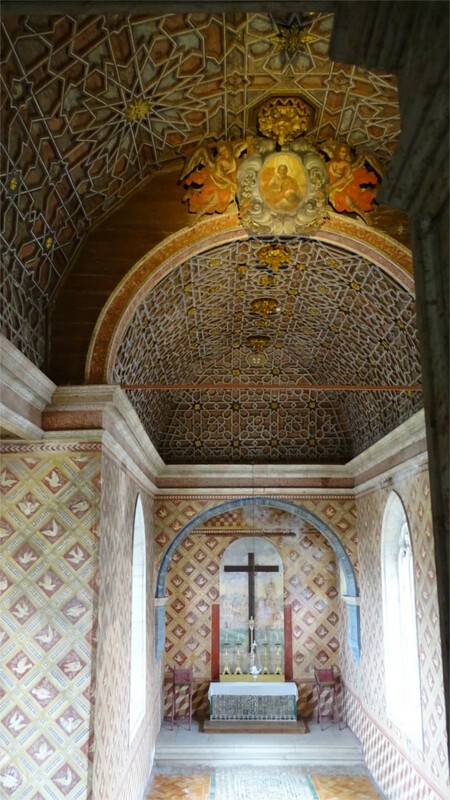 The chapel inside the palace, which you see in the photo above, is an example of this style. And a particularly fine example, one must say. In Seville we visited the cathedral, reputed to be the world’s largest. Before my feet gave up, we chanced on the ornate catafalque (see the featured photo) which holds the remains of Christopher Columbus. This reminded me of the wars of geometry which Portugal and Spain fought across the world. The background to this is well-known. In 1486 Bartholomew Dias had sailed around the Cape of Good Hope in Africa, and opened up the sea route to Asia for Portugal. Unable to compete in the east, Ferdinand and Isabel of Spain decided to finance the harebrained scheme of Columbus to find a westerly route to India after the fall of Granada in 1492. Spain hit gold, literally, when Columbus chanced on the continents now called the Americas. The wars to control the sea-routes east and west went on for another couple of years. By 1494 Portugal and Spain involved the Pope in finding a political solution to end these skirmishes. It was agreed that everything to the east of meridian 46 degrees west would belong to Portugal and everything to the west to Spain. The agreement clearly did not consult geographers and geometers who could have told their political masters that you cannot divide a sphere into two parts by one line of latitude. The result of this error, you might say, is history. In 1513 the Pacific Ocean was discovered by Balboa and his crew. Within years Spain crossed the Ocean and skirmishes broke out on the eastern edge of the Pacific. The new wars between Spain and Portugal were eventually halted by political recognition of mathematical facts. The meridian of 142 degrees east was the chosen as the second dividing line. In 1529 Portugal and Spain agreed that part of the world between these two meridians which included the Americas would belong to Spain, and the rest to Portugal. It was hot in the cathedral, and I decided to sit down while The Family walked about. I slipped into my siesta which ended only when she came back to say we could go. Spain is a large country, as countries in Europe go. Several hundred kilometers between cities is not unusual. We decided to take trains during our trip. There are the high-speed trains (AVE) which travel at about 300 Kms/hour and the slower regional trains which do one-third the speed. You need reservations to enter an AVE. 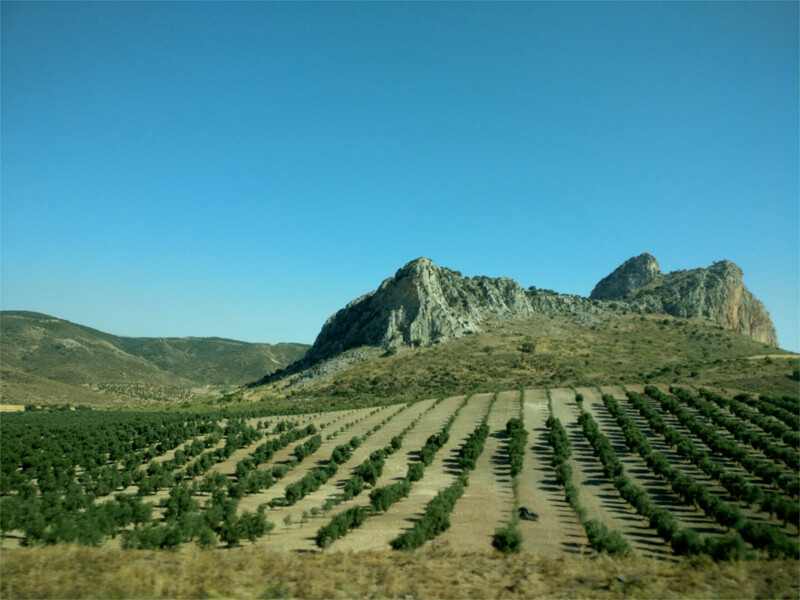 Since we took trains, we saw a lot of the Spanish countryside. Today, as we travelled on a regional train from Seville to Granada, we looked out at the usual flat landscape. In this season the temperature outside at 5 PM was around 44 degrees Celsius. Fields were dry and yellow. In the rest of Europe you see a mild powder blue sky. Here the sky was like India’s, a blinding blue-white. It looks colourful in the featured photo because I took it through a polarized filter. If I hadn’t, then all the colours would have been bleached out, and the clouds would have been invisible. The Family looked out and said "The countryside is so flat." That it is, as you see in the featured photo. We’d seen this flat countryside between Madrid and Barcelona, and then again on our way to Seville. Now it looked like it was going to be flat all the way. We had a little surprise about an hour out of Seville. An announcement on the train told us that there was work on the tracks, so our train would stop at the next station. We were to get out and follow railway staff who would take us to a bus. We’d noted earlier that changes are conducted very efficiently by the friendly staff who take special care of foreigners, even though they usually speak very little English. We came to some buses parked near the exit from the station. Someone told us which was the bus to Granada. On the highway we finally saw some hills. You can see one of them in the photo above. 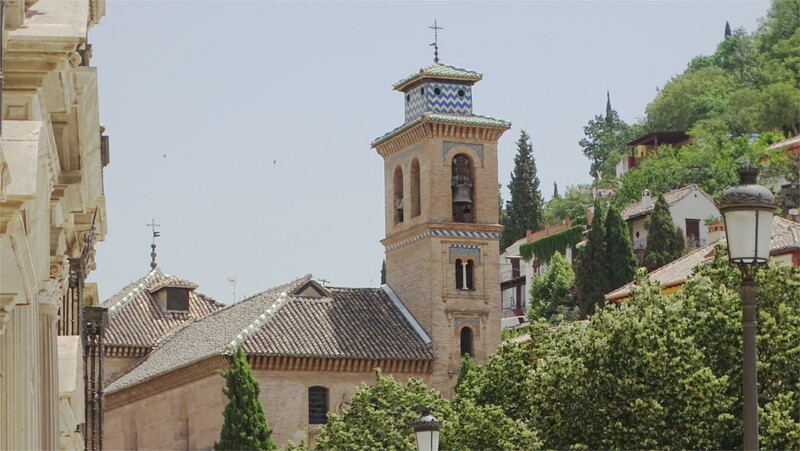 Tomorrow we plan to climb one which stands at the centre of Granada to see the Alhambra.